Wednesday, July 20 is the final day of EFF's Summer Security Reboot, a two-week membership drive that focuses on taking stock of our digital security practices and bolstering the larger movement to protect digital civil liberties. Besides a reduced donation amount for the Silicon level membership, the Reboot features sets of random number generators: EFF dice with instructions on how to generate stronger and more memorable random passphrases. EFF even produced three new passphrase wordlists to improve upon Arnold Reinhold's popular Diceware list, first published in 1995. EFF is a longtime advocate for personal security, and over the years we have continued to fight threats to user privacy and freedom. 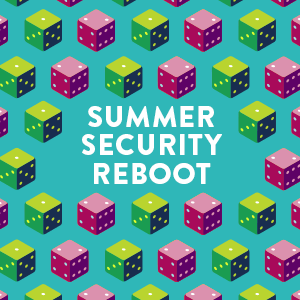 With the Summer Security Reboot, we want the public to engage with the larger questions of how one can and should control personal information in spite of high-profile attempt after attempt to compromise our devices. The world has increasingly recognized privacy and strong crypto as integral parts of protecting international human rights. A recent Amnesty International report states encryption is "an enabler of the rights to freedom of expression, information and opinion, and also has an impact on the rights to freedom of peaceful assembly, association and other human rights." Strong passphrase use is but one basic part of a diverse toolkit that can help you protect personal information, whether from identity thieves or government surveillance (ideally both!). We took to Twitter last week mashing up popular film titles and quotes with references to privacy and security to help draw attention to online rights issues. It resulted in a full day of #SecFlix. Numerous supporters and even EFF staffers contributed a number of gems. Make no mistake: EFF is on a mission to ensure that digital civil liberties are core issues everywhere and part of public discourse. While lighthearted and beautifully geeky in nature, EFF's Summer Security Reboot takes aim at accelerating the adoption of privacy practices and values. We must face the next stage of online challenges with action and the strength of our numbers. If you are not yet an EFF member for this year, I encourage you to join now to uphold civil liberties and protect yourself, your personal information, and your rights.